The Kollyvades' greatest achievement was the Philokalia. This anthology borrows from thirty-six Church Fathers and ascetics from the fourth to fifteenth centuries; all the texts suggest that a direct relationship of man with God, and a bodily perception of God through purification of the mind by ceaseless mental prayer, are indeed possible. Makarios Notaras (1731-1805), metropolitan of Corinth, was a leader of the Kollyvades' movement without being an Athonite monk. In Hydra Makarios met Nikodemos of the Holy Mountain (1749-1809), a turning point in both their lives. They compiled together the Philokalia of the Holy Neptic Fathers. 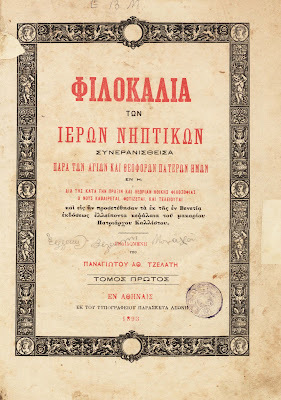 Makarios went to Mount Athos for the first time in 1777, handing Nikodemos the Philokalia manuscripts to check and compare with codices in the Athonite libraries. In the context of his times, Makarios was an astonishing phenomenon. Europe was being transformed; a new world was being born amidst frenzied enthusiasm. Society, politics and ideology were changing radically; the speed of change excited the enslaved people of the East, arousing new hopes. The French Revolution was central, but a lot happened just before or afterwards: Napolean's early triumph as "the Liberator", the United States of America's Declaration of Independence, the awakening of nationalism, the radical ideas of the Encyclopaedists, Voltair's iconoclastic language, Fichte's criticism of all "revelation", Kant's reinvention of metaphysics and ethics, the founding by liberals of political science, the allure of revolutionary politics, impressive advances of science, and bold innovations in art. The impetus of social and cultural change in the West seemed unprecedented. The Ottoman Empire's oppressed rayahs were particularly excited by this. Educated Greeks following European developments tended to align themselves unreservedly with modernism's ideas. But the Kollyvades dissented: a handful of humble, scholarly monks gathered around Makarios. Their inspired and fruitful opposition to the new European world reveals an astonishing historical perspicacity. They provided their enslaved nation with fundamental texts of spiritual and cultural self-awareness under very difficult conditions. Against modernism, they proposed to reawaken humanity to its essential, original needs, illuminated by the Church Fathers' ethos and experience. They rapidly produced the first printed editions of Gregory Palamas, Symeon the New Theologian and Mark Eugenikos, in the original or in a more popular idiom. These works and writers had been completely forgotten for three and a half centuries, even amongst ecclesiastics. 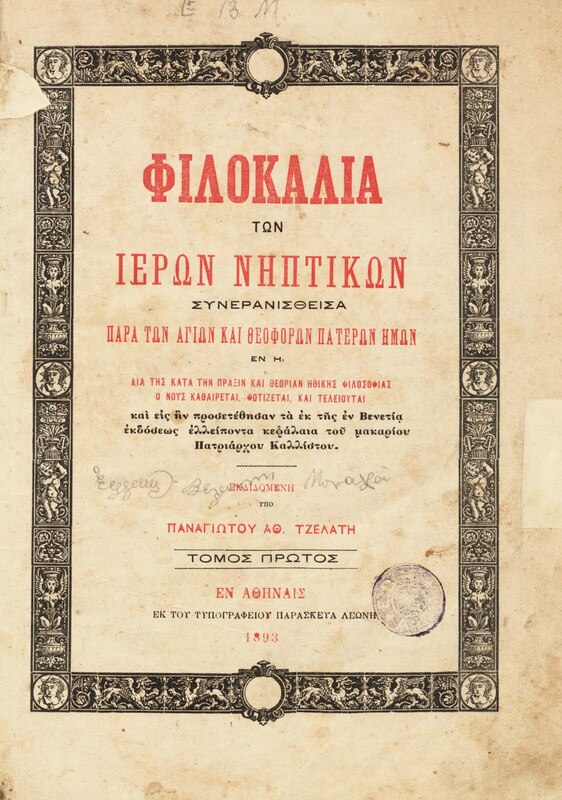 The Kollyvades themselves produced catechisms and apologetic works to sustain the Greeks' Christian resistance. They also composed biographies of neomartyrs to provide the faithful with recent examples of sacrificial self-denial. The Kollyvades understood how the complex new European order was actively opposed to the religious oppression and obscurantism which had caused people to lose their faith. That is why they presented the Philokalia as a witness to the genuine experience of the Church. They focused on the central promises of the Church, on the ascetic goal of the monks and the laity, on palpable experience of the Gospel's revelation. This is surprising. After three and a half centuries of rationalism and moralism by Greek scholars, imitations of Western "religionization", scholastic "Confessions" and inadvertent concessions to secularization, after three and a half centuries of patriarchs, schools and students alienated from their tradition, St. Makarios' revelatory judgement rescued from oblivion the Church's witness to the most essential issues of the Christian faith. The Philokalia is not a collection of specialized "mystical" texts; it demonstrates what we seek when we participate in the Church. We are not interested in the validation of concepts or legal guarantees of ultimate justification. Human beings seek the love (philia) of the good and long for beauty (kallos). Longing for the beauty of the Lord's Person is part of the personal relationship or communion that constitutes incorruptible, immortal, true life. A personal relationship with Christ's Person, like true love, requires a persistent effort to let go of egocentricity and be freed of the natural selfish will. We actively seek this relationship by constant invocation of the Beloved's name, coordinating mind and breathing to invoke His mercy and share His life. Constant loving invocation purifies the mind of its illusions, and the desires at the "heart" of man of sensual distractions, those appetites that endow the created with self-existence; it joins the "mind" with the "heart" in loving self-offering. Desire is personalized and the mind subordinated to the longed-for relationship. Awareness of being physically alive, even the natural function of breathing, can be transformed into a desire for the loving relationship, freeing humanity from the limitations of its created and mortal nature. Human beings know existence not just as nature but as a loving relationship which is also the true life of the Triune Deity. The Philokalia's publication in a tentative way constituted a challenge of one culture by another. Enthusiasts for "progress" aspired to an anthropocentric autonomy of mere biological existence; their intoxicating freedom was divorced from social responsibility, individuals' rights became an absolute, and they wanted to make life as efficient as a machine. But truth is more than usefulness. Communion and love are important, personal otherness has priority over individualism, life is not mere survival. Joy and hope can transcend death. What common life did the Kollyvades want and the Philokalia imply? What kind of society, technology, politics, economics and culture? A different understanding of human existence and action cannot be reduced to a single program. At a critical historical moment Hellenism followed the Enlightenment rather than the Kollyvades. Hellenism came to be organized as a national state, borrowing Europe's institutions, administration and ideologies, and losing its cultural identity and otherness in the process. The Philokalia nevertheless exercised profound influence beyond the Greek world, like any true manifestation of the Greek spirit. In 1793, eleven years after the first edition of 1782, the Philokalia was published in Slavonic translation. The initiative came from the famous Ukrainian monk, Paisy Velichkovsky (1722-1794), abbot of Neamt Monastery in Moldavia, who had spent eighteen years as an ascetic on Mount Athos. He knew Makarios Notaras, who sent him a copy, and he supervised the translation into Slavonic by Neamt monks. It was immediately sent to St. Petersburg for publication, where Metropolitan Gabriel assembled a group of monks and professors of the Academy of Alexander Nevsky who knew Greek to polish the translation. The terminology and nuances of Byzantine ascetic literature were transposed for the first time into classical Russian. The Slavonic translation of the Philokalia was decisive for the spiritual life of Russia. This dynamic revival of ascetic and Church-centered piety was known as the "Philokalian Renaissance"; from the mid-nineteenth century it sustained Russian Orthodoxy's spiritual tradition, which had been undermined by Peter the Great's reforms. The center of the "Philokalian Renaissance" was the famous Optina Monastery, where Paisy Velichkovsky's students gathered, bringing with them from Neamt many more manuscript translations of the Greek Fathers. Ivan Kireevsky, a talented philosopher and author who had studied in Germany under Hegel and Schelling, supported the Optina monks, at once perceiving in the Philokalian texts an authentic sense of the Church and a philosophical position which alone could resist the challenge of European nihilism. They collaborated to publish a series of patristic texts in Slavonic: John Climacus's The Ladder, the Letters of Barsanuphios and John, Theodore Studites' Catechises, Isaac the Syrian's Ascetic Writings, etc. Optina as a Philokalian center was the occasion for Kireevsky's friendship and collaboration with three other significant philosophers: Khomiakov, Aksakov and Samarine. These were the first Slavophiles, whose thought inspired such ferment in nineteenth-century Russia. The Slavophile movement was complex and its adherents had very differing approaches, but a common orientation unites them. They resisted Western rationalism and its concomitant individualism, and revered the vital energy preserved in Orthodox Church Tradition and popular Russian piety. The spirit of European "populism", derived from Pushkin and Gogol's wonderful writings, influenced the Slavophiles as did the Philokalian Renaissance and monastic centers as Optina. Ecclesiastical currents such as those of the Philokalian Renaissance and Optina came to exercise a decisive influence on the Russian intelligentsia, later inspiring works by Tolstoy, Soloviev, and especially Dostoevsky. Tychon in The Possessed and the starets Zossima in The Brothers Karamazov are drawn from Dostoevsky's personal experience of Optina. But the full benefits of the Philokalian Renaissance were reaped only in the mid-twentieth century by Russian theologians of the post-revolutionary diaspora. For the first time since the fourteenth century, the Orthodox recovered their theological self-awareness and identity. This reawakening influenced all European theology, stimulating leading Roman Catholic theologians to study the Greek Fathers and Orthodox worship and art. The "neo-patristic" movement among Roman Catholics found encouragement in the Second Vatican Council (1962-1965), but Vatican conservatives soon stifled it. Russian theologians were more influential in Greece, Romania and Serbia, initiating the "theological spring" of the sixties. One hundred and seventy years later, the Philokalian Renaissance thus returned to the territory of its creator, St. Makarios Notaras. 1. Edited by P.A. Tzelatis. 2. In five volumes, edited by the Archimandrite Epiphanios Theodoropoulos and published in Athens by Astir. 3. The publisher's reservations about the commercial viability of such a "specialized" work were overcome by their editorial advisor, the poet T.S. Eliot. The work in fact proved highly successful, with eight reprints in ten years. 4. For a full bibliography to 1984 see the Dictionnaire de Spiritualite 12 (1984) cols. 1336-52. From Orthodoxy and the West, Holy Cross Orthodox Press, pp. 122-128.